Recently we shared a simple blogger template built using twitter bootstrap. You can preview it here responsive blogger template. Today we are coming with another simple and basic twitter bootstrap blogger template. Like tour earlier template this template is also fully responsive blogger template with a maximum width of 940 px. We are using twitter bootstrap responsive styles in this blogger template, that will give consistent performance in most of the devices. You can check the responsive nature of this blogger template using our responsive design testing tool. 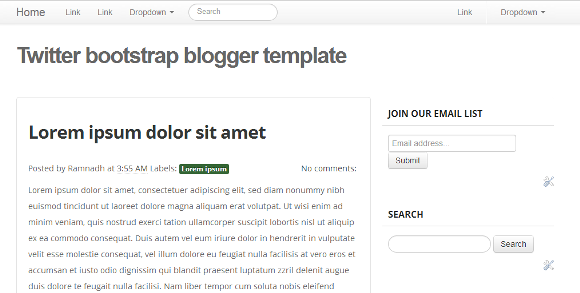 Preview this blogger template and should add your reviews about this template as comments. That will help us to produce better templates in future. It is search engine blogger template with title and headings tags optimized for better ranking in Google search and other search engines. This blogger template is coming with threaded comment for blogger blogs. We hope this template will help you to change complete design and style of your blogger blog. Don’t forget to share about this template with your friends and followers.